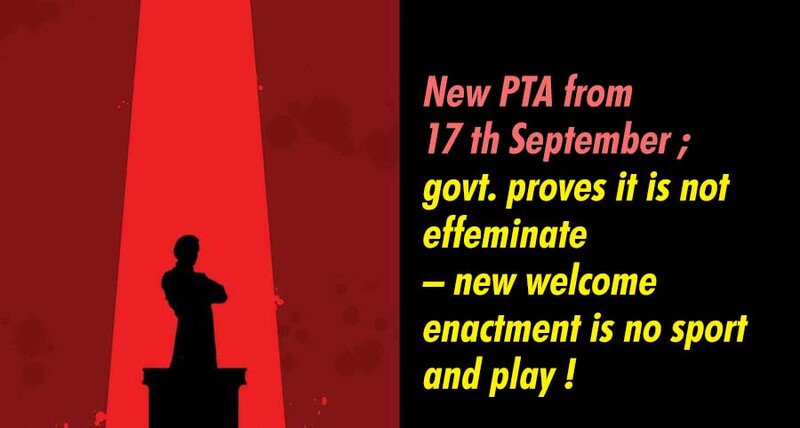 LEN - www.lankaenews.com | New PTA from 17 th September ; govt. proves it is not effeminate – new welcome enactment is no sport and play ! (Lanka e News -30.Sep.2018, 10.45PM) The infamous Prevention of Terrorism Act (PTA ) which was enacted during the period when the ethnic war began in 1979 , was replaced by a revised improved version when the parliament passed the modernized new Prevention of Terrorism enactment .This became law on the 17 th of September following the gazette notification . The all important gazette notification can be read by clicking on the link at the end of the article. This new most useful Act which conforms to international standards is based on local requirements, and is against terrorism while being designed to dispense justice .It is emphasized at the beginning of the Act this is a methodology introduced to ensure fair play and justice. This Act is applicable to those engaged in terrorism within the country and outside . Under the new Act if serious harm is inflicted on places used by the public , the environment or the facilities provided by the government those crimes too are punishable under the Act if proved guilty .Hence this ACT is no sport and play. Even if damage is done to the registered websites , those offences also come under the new Act. If harm is caused to the religious cultural heritage that too can be brought under the new Act. If any risk is engendered to the health of the public or a section thereof , that too can be brought under the new PTA . It is well for the doctors who staged unjust strikes in the past to take serious note of this. The GMOA doctors cannot continue to behave like GOMA (cow dung brained ) doctors . Plundering or robbing of State assets including Intellectual property is interpreted specifically as an act of terrorism . The punishment ranges from fines not exceeding Rs. one million to life imprisonment . Although suppressing or publishing matters identified as ‘secret information’ are within the purview of this new ACT, publishing of news by the registered electronic or print media in the best interests of the public in good faith to enthuse the public or classical publications are not offences under the new ACT. The enforcement of all these laws belongs to the Police and not the forces. Under the new PTA , the closest relative of those taken into custody should be informed of it within 24 hours , and the suspect should be produced before a magistrate within 48 hours. However the magistrate is not empowered to grant bail. Only the high court can grant bail. The suspect can be held in remand custody without filing cases only for a period of six months. If this period is to be extended , only another six more months is permissible. Every two weeks , the suspect shall be produced before a magistrate. These particulars must be made available to the Human Rights Commission at any time when requested. No matter what , since the actions of the public if necessary can be brought under the prevention of terrorism laws relying on some angle (interpretation) of the ACT , and therefore it most decisively impacts on the daily lives of the people , it is most paramount the people of SL enlighten and educate themselves on this new law.